If you’re like me when I was new to all-grain brewing, you were reading every post and homebrew book out there trying to figure out why your mash conversion efficiency was so much lower than you planned/wanted/expected. I came across some reference to mash pH and its effect on conversion efficiency, filed it under “way too complicated and science-y for a hobby”, and moved onto something easier to relate to. I bought a pack of pH test strips and used them once and realized the color looked slightly like none of the marks on the box and simultaneously like all of the marks. I again shoved this pH stuff to the background of my homebrew brain. Now, several years in, I’m more comfortable with my processes, equipment and recipe creation, and am looking to chase out any variables that can negatively affect my beer. Reading brewing literature in pursuit of better beer, I can no longer ignore the emphasis they place on a target mash pH when brewing light colored and light bodied beers. 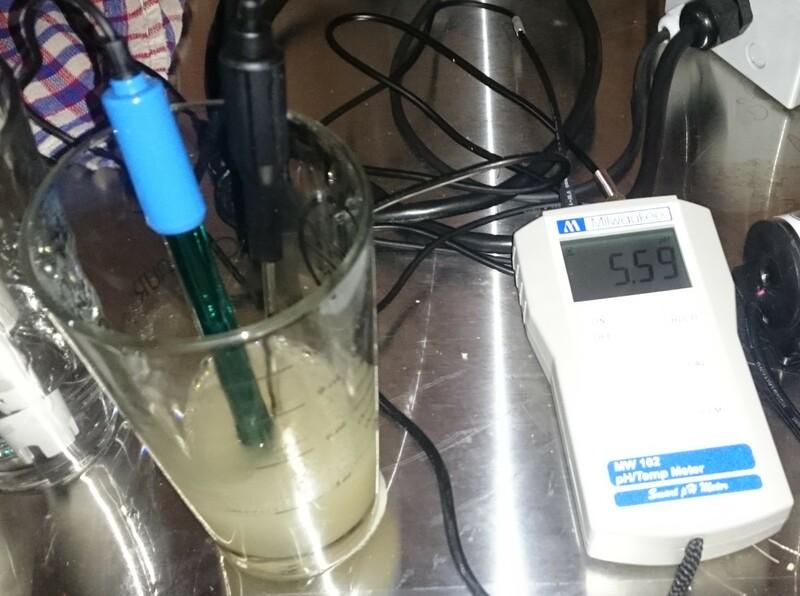 So I find myself back wanting to measure and start to understand my mash pH. I’m an engineer by profession, but I only dive into mass-nerdiness to a certain depth before pulling back and figuring out how to simplify complicated physical phenomena. In chemistry terms, pH is a measure of Hydrogen ion concentration. Don’t skim ahead yet, that’s as deep as I’m going. For me, that’s enough to enable a wander through this variable. Your wort is your own chemical concoction. There’s all of this stuff going on based on amount of malts, types of malts (due to their own chemical properties), type of water, and what minerals you have floating around in your water. All of that affects your pH. There is good information out there about how you can tweak different variables to affect your pH, and you don’t have to think of Hydrogen ions at all. But you do need a way to measure the pH so you know when you’ve got all your ingredients dialed in to hit your target pH. Temperature has a huge effect on pH, in multiple ways. First off, it affects your chemical concoction itself. As your wort heats up, it allows the ions to move around more freely (and remember those ions are what your pH measurement is all about), and it can also affect/create chemical reactions that change the chemical make-up of your wort and again play around with the amount of Hydrogen ions floating around in it. Because of these effects, any reference to a “target” or “ideal” pH that don’t also come with a temperature reference are incomplete. The most frequently cited target range is 5.2 – 5.6, and in John Palmer’s great encyclopedia, How to Brew, he thankfully notes in his chapter on adjusting mash pH that this is at room temperature. This makes good practical sense for 2 reasons. 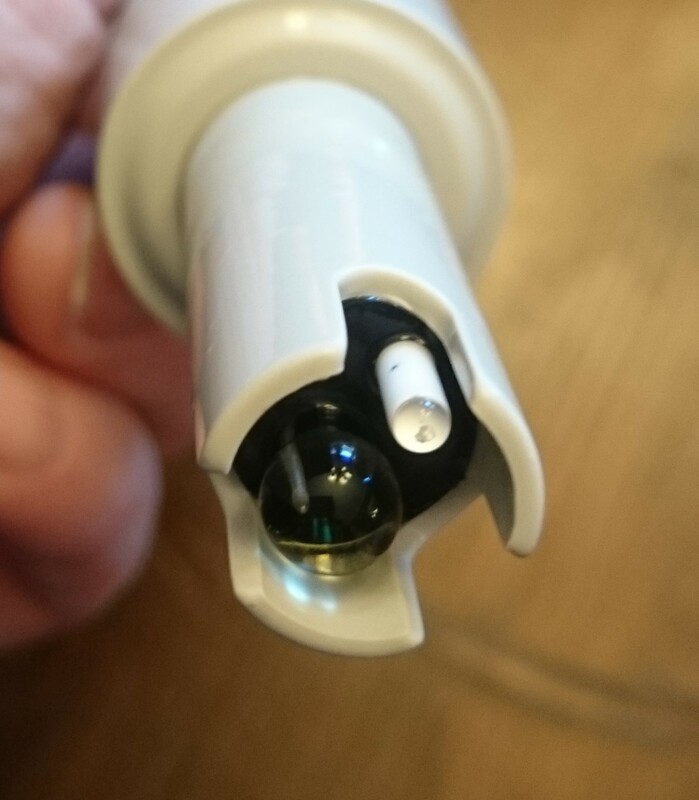 The first is that most pH meters cannot handle high temperatures (above ~120 F) due to the physical aspects of the sensor. So unless in the case of higher end equipment, you’re not going to ever be reading at mash temperature itself. And applying some crude rule of thumb like “add 0.3 to your pH reading” is so general that it blows away the precision you’re trying to hone in on by specifying a tight target pH range. The second reason room temperature reading makes sense is that as soon as you pull off a sample of wort, it is cooling down to head toward room temperature anyway. So trying to measure pH (which we’ve just said is very sensitive to temperature) on a sample that is quickly changing temperature is going to introduce a lot of measurement error. 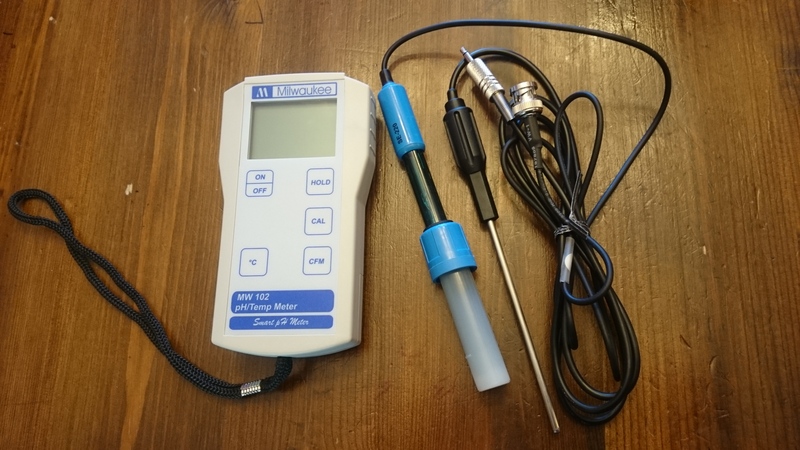 In addition to your wort sample itself having a pH difference at different temperatures, pH measurement electrodes have a temperature sensitivity. Most decent sensors on the market have ATC (Automatic Temperature Correction), which means they have built-in software to adjust the reading they get from the electrode based on the temperature they are reading. They adjust this back to what is defined as standard conditions of 77 F. It is also worth noting that when you do the pH sensor calibration with the buffer solutions, the calibration will be slightly different at different temperatures. So for the best accuracy, you want your calibration solution temperature to be the same as the temperature you measure your wort at. Yet another reason why, from a practical standpoint, this should be done at room temperature. Milwaukee Instruments has a wide range of pH meters for all different applications. Although they do offer a bargain-priced pH600 meter, it is really just a slight step up over pH test strips in accuracy, and build quality is what you’d expect based on its price. They suggested two meters that are popular with the brewing community of their MW102 and PH55 meters. The MW102 is their most popular seller in the brewing world, and it comes with 2 separate probes (one for pH, one for temperature) that plug into the base. It displays measured pH to two decimal places, and has a pH measurement accuracy of +/- 0.02 pH. The PH55 is more compact in that it doesn’t have separate leads and everything is contained in a single unit. It displays pH reading to one decimal place, and has a pH measurement accuracy of +/- 0.1 pH. 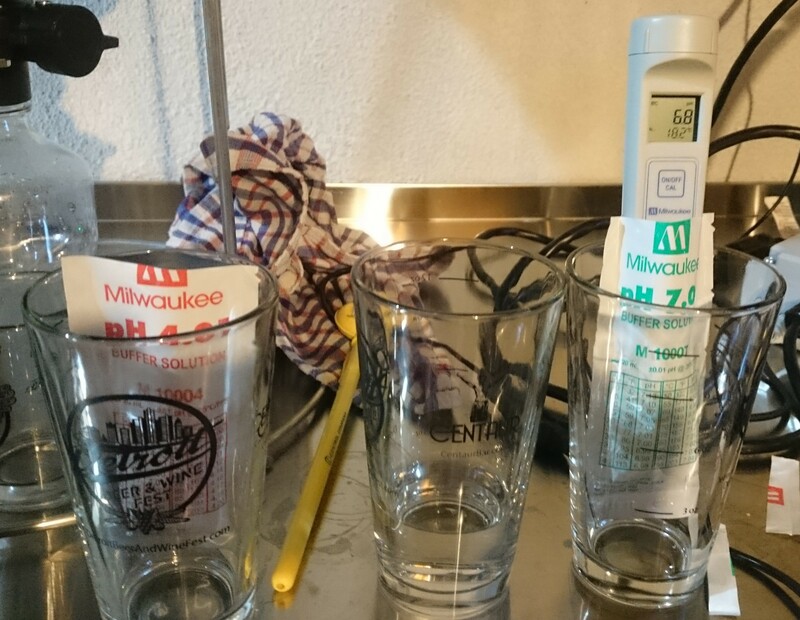 The calibration process was straightforward on both meters, using standard pH solutions provided by Milwaukee. I did a couple of experiments using some test mashes with some different brewing salt additions. Although the salts weren’t designed/intended to adjust the pH, I was able to confirm that my typical “Malt Forward” water profile and “Hop Forward” water profile had no notable effect on mash pH, as they both were within accuracy tolerance of each other. I also saw that without adding any Acidulated Malt or Lactic Acid (typical pH lowering solutions), my basic mash of 4 lbs of 2-Row + 1.3 lbs of White Wheat in 3.75 gallons of water landed within Palmer’s suggested pH range of 5.2 – 5.6 pH. I also used both meters on a couple of standard brew day batches and saw my pH was a bit out of that range, suggesting it might be something worth tracking more closely if I want to hone in my best recipes. I found the wires on the MW102 to be a bit cumbersome as they wanted to snag and catch on things on my over-crowded brew table. Not to the point of complete annoyance, but behaved I guess as you’d expect for a couple of wires hanging about. The PH55 was more convenient in its self-contained package. But you’d have to consider the accuracy, and trying to land within a 0.4 pH zone, a measurement error of +/- 0.1 pH is significant. Both meters were made of good materials and good craftsmanship, so you definitely get a good product when parting with your money. And with a new variable to understand and try to tame, you definitely will be doing a lot of measuring! Special Thanks to Milwaukee Instruments for providing the units used for evaluation in this review. This entry was posted in All Grain, Amazon, Featured Reviews, pH, Reviews & Top Posts on January 31, 2018 by admin. Good review, thanks for posting! The MW102 is a workhorse used by pro brewers as well. – Buy extra calibration solution so you can quickly check your meter at the start of brew day. You may not need to re-cal every time, but you do want to know what your offset is when you start the day.